The rise in third-party cargo-handling services has not only diversified the warehousing landscape, but also shortened the supply chain by locating of inventory closer to its consumers who demand faster and more convenient access to their purchases. Our gateway is home to more than 20 near-terminal transload and cross-dock facilities and the second-largest concentration of warehouse and distribution centers on the West Coast (fourth- largest in the U.S.). 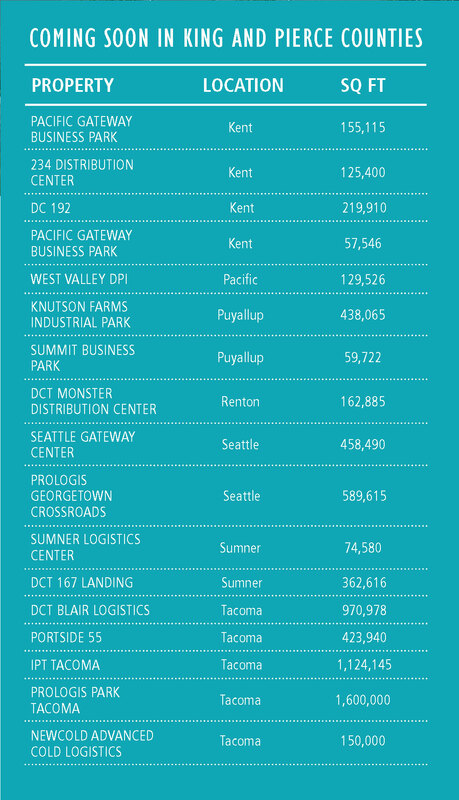 The recent growth in the Seattle region has driven demands for more distribution capacity and transloading services. As a result, developers are taking advantage of available land for new development in places like Kent and Puyallup River valleys, and more recently in the South Sound. Commercial brokerage reports estimate more than 330 million square feet of existing industrial space in the Seattle-Puget Sound market, including nearly 5 million square feet of new inventory added in the first three quarters of 2017. In addition, there are 24 buildings totaling more than 6 million square feet currently under construction for delivery in 2018. As of the end of 2017, only about 20 percent of that space had been pre-leased. More than 4 million square feet will be built within Tacoma’s port industrial area. Avenue 55 has partnered with the Port of Tacoma on Portside 55, a 424,000-square-foot warehouse facility located at the port. Joe Blattner, president and founder of the Seattle-based company, acknowledged the increased scarcity of land available for industrial use in Seattle. While Avenue 55 has property peppered across the Puget Sound area, his company opted for a more creative approach for the Portside 55 project. Despite environmental remediation required prior to breaking ground, Blattner said the location was one of the reasons they pursued the project. Portside 55 will be completed in two phases: two buildings in 2018 and a third one by early 2019, all with access to rail service. The region’s growing population and new warehousing facilities opening at strategic locations are two factors reshaping how cargo is transported to Chicago and the Midwest. Also coming online this year is Prologis’ Georgetown Crossroads facility located outside of downtown Seattle. It features multiple levels of distribution space, a first of its kind in the U.S. The 590,000 square-foot structure will have truck ramps leading to the second level for transloading and cross-docking uses. The third floor will be equipped with freight elevators for lighter-scale warehouse operations. Tom Bellerud, NWSA director of business development, said extra capacity for warehousing space will allow terminals to move containers off the terminals and provide more opportunities for shippers. Blattner echoed the trend: A good strategic location is a game changer. While Avenue 55 begins construction and markets for building tenants, Blattner envisions a bustling facility that will cater to the NWSA cargo business.